So I saw this firing up a few months ago and it tickles me deeply that this is happening: while Amazon and Barnes and Noble have been duking out in the US ebook market, Kobo has swooped in to team up with independent bookstores to sell devices and ebooks through them! 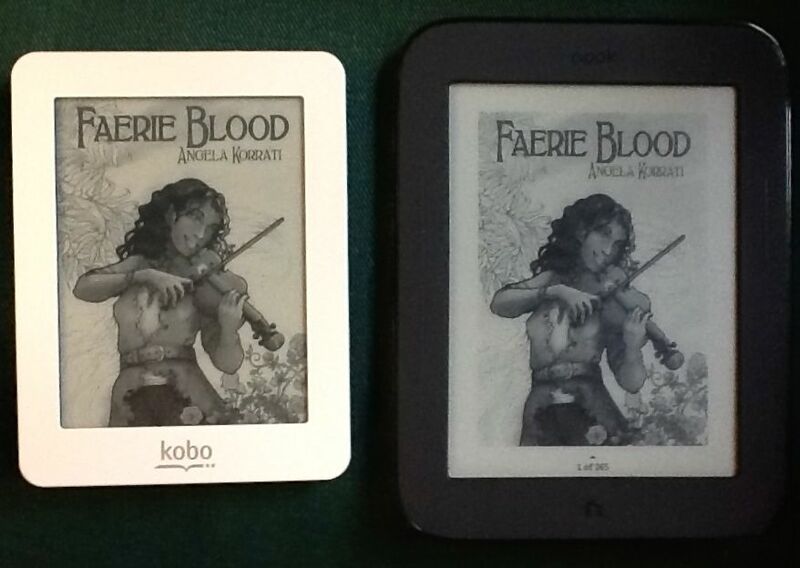 Which means that two of my favorite indie bookstores, Third Place Books and the almighty mecca of bookstores that is Powells, are now additional places where you can get Faerie Blood in ebook form if you have a Kobo account. And if you buy through their sites, you then do your part to support these lovely indie bookstores. How awesome is this? PRETTY DAMNED AWESOME. It particularly tickles me to see Third Place doing this, since as y’all may recall, their Third Place Press IS my printer for the hardcopy edition of Faerie Blood! And now you can also buy the ebook from them as well! Now, of course, you’d need an actual device to read them on. I have yet to handle a Kobo reader of any sort myself but online friends of mine who are Kobo customers have spoken well of them. (Alternately, I know you can also run the Kobo app on iDevices and one presumes there is an equivalent for Android devices as well.) 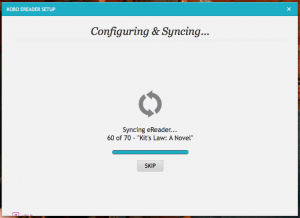 What experience I do have with Kobo though is this–I do have an account with them, kept because sometimes I want to get ebooks that Amazon and B&N don’t have. Oftentimes I’ve found that they might have, say, the UK release of something before Amazon or B&N gets the US release. But man, now that I know Third Place has teamed up with them, I may have to seriously rethink my ebook buying patterns. And if I grow weary of the Nook, I’ll have to put serious consideration into jumping ship to Kobo. Because I loves me some Third Place, and I’d love to see this effort of theirs pay off! I totally fell over finishing these posts up, but would like to get back to this series of posts now that I have new data to add to them courtesy of my recent iPad. And, conveniently enough, that ties back into the last post I did, which was about how to check out library ebooks! Go install the app from the App Store. If you don’t have one already, create an Adobe ID so you can authorize your i-Device to unlock Adobe DRM books. Log into the app with your Adobe ID, and let it authorize your device. Click the “Get Books” button up in the right hand corner to search for library websites. I found mine with little effort, and once you’ve found your library, the app should add it to your list. You can then use the app to load your library’s website (it’ll open in Safari). In my case, that loaded in Safari and gave me a mobile version of the site, hooked into the app. Log in with your library’s website credentials so you can get at your account. Use the website’s systems, whatever they may be, to download items you check out. In my case, when testing this tonight, I had two books checked out and was able to simply tap the Download button on each to have them come straight down into the app. This was, in short, awesome. Don’t get me wrong, I actually prefer reading on the Nook (for various reasons I’ll get into in the next post in the series), but getting the library books onto the iPad was so much easier and less headachy than getting them onto the Nook that I will probably do this for all future library checkouts. The main point of headache for Nook-based checkouts, the painful ADE app Mac-side, is completely bypassed this way. I would definitely recommend this for my fellow i-Device owners. Now, here’s the best part: this app is not exclusive to i-Devices, either. There are desktop versions for both Windows and Mac, AND there are mobile versions for Android and Windows Mobile users as well. Check out these other versions, people, and report in on how well they work for you! All of this does of course assume that you have a valid account on whatever library system you’re checking out books from, so be sure and handle that separately from getting the app installed. You may need to hunt around a bit to find a library system you can use, if your local one doesn’t support electronic checkouts. Y’all please feel free to report in on what library sites you like, whether or not they allow checkouts from persons who don’t live in the area, and anything else you’d like to share! As a last note, thus far my library experiences with ebooks are limited to the Nook and to my iPad. So if folks out there are aware of other systems that allow interesting ebook checkouts, share those too! This is part 6 of my posts on how to read ebooks. Here I’ll get into how to check out ebooks from libraries that support that, and what you need to be able to do this. Basically, you will need two things: Adobe Digital Editions, and an account with the library of your choice (which must be set up to do ebook checkouts). I mentioned ADE in my previous ebooks post, so will just briefly repeat here that ADE is supported on Windows and Mac computers. (Linux users, you’ll have to run it via WINE, I fear.) It supports both EPUB and PDF files, and the list of ereaders it supports is over here. 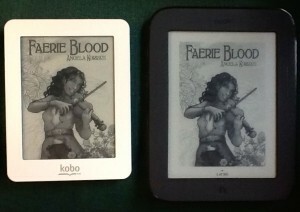 The major ereaders I’m aware of that ADE supports are the nook, the Sony readers, and the Kobo. Once you have ADE set up on your computer and an account with the library you want to get content from, you’ll basically want to follow the library website’s directions for how to check out a digital book. You’ll want to look for either EPUB or PDF files, depending on what ebook format you’re better able to read. Once ADE has the book, you can read it right there on your computer. However, if you want to copy it down to your ereader, you can also do that via ADE. If your ereader is plugged into one of your computer’s USB ports, ADE should see it (one more note: you may need to plug in the device first and then launch ADE; I have that problem with my nook). And if ADE can see it, you should be able to just copy the library book right down to the device. And then you can read! You should be able to use ADE to delete the file off the device when you’re done with it, and you can also use ADE to “return” the book as well. For the next post in this series, I’ll talk a bit about various technical differences between devices I’m familiar with, and how difficult it is to get books onto them. It occurred to me that I should have a top-level page about how to read ebooks on my site, so I have now added one. If you hit the angelakorrati.com index, you should see it now on the menu. If you like, please feel free also to refer people interested in the topic to http://www.angelakorrati.com/how-to-read-ebooks/. Comments on all the posts welcome, and I’ll edit and update the posts to reflect any errors I might have made. Please especially feel free to share your experiences with the reader clients of your choice on my previous post, folks!